Alexander Gray Associates presented Haptic, featuring work by artists Polly Apfelbaum, Amy Bessone, Alexandre da Cunha, Leonardo Drew, Melvin Edwards, Ann Hamilton, Harmony Hammond, Sheila Hicks, William J. O’Brien, Howardena Pindell, Norbert Prangenberg, Jacolby Satterwhite, Hassan Sharif, and Betty Woodman. Together, they simultaneously expand and question traditional craft practices within the context of contemporary art. In addition to the variety of media, the artists also represent a diversity of cultures and generations, highlighting the omnipresence of craft modalities across geographies and ages. Alexandre da Cunha, Sheila Hicks and Hassan Sharif refer to global traditions in their woven compositions which simultaneously recall geographically-situated histories and ingrained understandings of gender roles. Harmony Hammond and Howardena Pindell, collage and paint built-up surfaces which evoke abstracted female bodies. 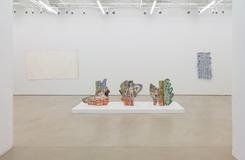 Amy Bessone, William J. O’Brien, Norbert Prangenberg and Betty Woodman render fragmented portions of the human body in clay, to create both functional and decorative art objects that retain visual traces of the maker’s touch. Polly Apfelbaum utilizes saturated color and abstract forms in her wall-based ceramics, and implies human presence through her use of peoples’ names as titles. Ann Hamilton and Jacolby Satterwhite use the aesthetics of aggregation to mine memory, both communal and personal. Leonardo Drew and Melvin Edwards employ assemblage to create sculptural objects that indicate the links between craft and craftsmanship. As a group, these artists subvert traditional modes of making (craft) by imbuing their work with personal perspective while commenting on social or political realities. Polly Apfelbaum (b.1955) was born in Abington, PA and lives and works in New York. Amy Bessone (b.1970) was born in New York and lives and works in Los Angeles. Alexandre da Cunha (b.1969) was born in Rio de Janeiro, Brazil, and lives and works in London. Leonardo Drew (b.1961) was born in Tallahassee, FL, and lives and works in Brooklyn, NY. Melvin Edwards (b.1937) was born in Houston, TX, and lives and works in New York, and Dakar, Senegal. Ann Hamilton (b.1956) was born, and continues to live and work in Ohio. Harmony Hammond (b.1944) was born in Illinois and lives and works in Galisteo, NM. Sheila Hicks (b.1934) was born in Hastings, NE, and lives and works in Paris. William J. O’Brien (b.1975) was born in Eastlake, OH, and lives and works in Chicago, IL. Howardena Pindell (b.1943) was born in Philadelphia, PA, and lives and works in New York. Norbert Prangenberg (b.1949– d.2012) was born in Rheinland, Germany, and died in Krefeld, Germany. Jacolby Satterwhite (b.1986) was born in Columbia, SC, and lives and works in New York. Hassan Sharif (b.1951) was born, and continues to live and work in Dubai, United Arab Emirates. Betty Woodman (b.1930) was born in Norwalk, CT, and lives and works in New York.